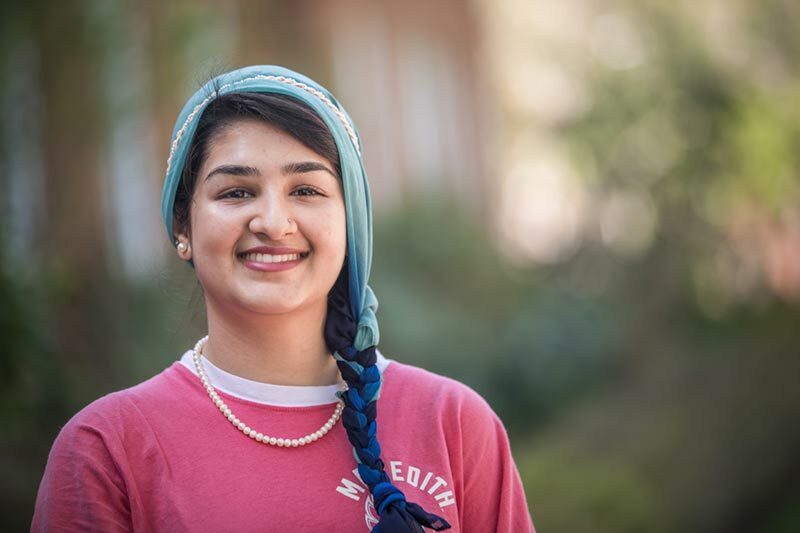 Determined to leave her mark in the community, Nabiha Khan, ’20, is working toward a degree in biochemistry at Meredith College while being actively involved in undergraduate research, campus traditions, and student organizations. Nabiha dove into undergraduate research the summer after her freshman year and it has become an important part of her Meredith experience. She was greatly influenced by her mentors Paul Winterhoff, director of undergraduate research, and John Mecham, retired professor of biological sciences, who encouraged her to reach beyond her comfort zone and explore different research opportunities. With the support of her faculty, Nabiha has had the opportunity to present at multiple conferences both regionally and internationally, including at Harvard University. “Meredith taught me that I am strong and independent, but I should never be afraid to ask for help when I need it because I know I can always turn to my mentors for advice and direction,” said Nabiha. Intrigued by the idea of working in medicine, Nabiha’s pre-health adviser Karthik Aghoram, professor of biological sciences, encouraged her to apply for a summer pre-med program at UNC. Nabiha spent the following summer as a part of the UNC Medical Education Development (MED) program. “Dr. Aghoram is constantly pushing me to apply to programs like UNC MED. It was a life-changing opportunity for me,” said Nabiha. When she isn’t focused on her research, Nabiha is a proud member of Tri-Beta and the Meredith Health Professions Society (MHPS). Finding herself enriched by her membership in these organizations, Nabiha saw the need for a Refugee and Immigrant Club and put that idea into action with some of her friends during her freshman year. Nabiha stumbled upon her enthusiasm for teaching while working as a teaching assistant for the biology and chemistry departments. This prompted her to consider pursuing an MD/Ph.D. program after graduating to combine her love of teaching with her passion for research. “Through this experience I learned that I want to do medicine as well as get a Ph.D. and that this is something I am perfectly capable of doing,” said Nabiha. Nabiha plans on practicing medicine in the emergency or pediatric field while continuing to further her education. During her time at Meredith, Nabiha has grown in her confidence while discovering new passions and drive.